In November, we celebrate National Home Care Month and National Family Caregivers Month, two observances that are core to FirstLight Home Care. Throughout the month, our FirstLight blog will focus on providing the tools, tips, resources and peace of mind so many family caregivers need. The first step is finding the right in-home caregiver. We invite you to comment and share the challenges and rewarding experiences you’ve encountered throughout your caregiving journey. Home care can be a lifeline for seniors who are aging in place, as well as those living with a disability or recovering from an illness or injury. Finding the right in-home caregiver can seem like a daunting task. It can be difficult knowing where to begin and what to look for when it comes to choosing the right caregiving partner for you or your loved one. Essential to any home care partnership is the caregiver. And finding the right in-home caregiver is key. Expertise and credibility. It takes a special kind of person to be an exceptional caregiver – compassion, empathy, optimism, sincerity, trustworthiness. But the best caregivers also are qualified, experienced and reliable. Find a provider that has years of experience in the home care industry. Look for providers who have a thorough process for recruiting, selecting and retaining their caregivers. Make sure all caregivers that are hired receive an in-depth background check and other appropriate employment screenings. Your home care partner should also secure and uphold the appropriate state licensing to provide services. Ongoing caregiver training. Select a partner that values ongoing and rigorous caregiver training and that has a well-defined process for managing quality of care. The right in-home caregiver will be trained in privacy issues to protect the confidentiality and safety of clients. The best caregivers are those who participate in continuing education. Client-caregiver fit. Each person is unique. 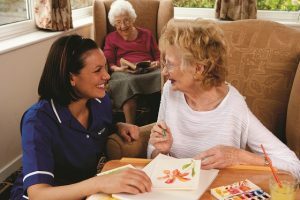 Look for a home care partner that is committed to matching the caregiver to the specific interests and needs of the unique individual being cared for. The most successful client-caregiver relationships are fostered when the caregiver is a good fit for the style, temperament, needs, interests and personality of the client. Communication with the family. It’s common for individuals who need assistance to have a family member or other loved involved in their care. The right in-home caregiver will engage the family in the ongoing care plan of the individual. Transparency also is key. Families should have complete access to tools that monitor their loved ones’ schedule and communicate with caregivers daily. Regular check-ins with clients to ensure safety and quality standards are being met. Resolving issues in a timely, thorough and caring manner. If you believe that hiring a caregiver would provide a needed lifeline for you or a loved one, FirstLight Home Care offers a broad range of non-medical home care services. With locations in more than 150 markets across the United States, we can help you or your loved one achieve and maintain independence in whatever place you call home. And with an unmatched Culture of Care, we can also help enhance quality of life. Find a FirstLight location today to request a free consultation. How would hiring a caregiver for an aging parent benefit you in your role as caregiver? Comment here, or head to our Facebook page to join the conversation. I’ve been thinking it would be good for some in home care services for my grandmother, and I think that getting some tips would be good. I’m glad you talked about being able to get in home care from people who receive ongoing training. I’m going to have to look for some quality in home care services and see what we can find! Thank you, Jordan, for taking the time to provide feedback. Non-medical home care can be valuable in many ways. We take great pride in the robust process we use to hire our caregivers. Then, once they are on board and trained, we ensure they receive continued training and education. Thanks for pointing out that we should find a caregiver that is able to match the style and temperament of the person they will be taking care of. My grandma has started deteriorating so my family is looking for someone to help take care of her in her house. Since my grandma can be a little prickly, we will be sure to find a caregiver that can handle that kind of personality. Thanks, Ashley. Our goal is to take care of your loved one just as you would. That initial caregiver match is so important to building the foundation for a great relationship and ensuring that the client is cared for and happy. I like that you talked about choosing a service that lets you monitor the care of your loved one. I have been looking for someone to help take care of my dad. I can see how it would be good to choose a service that gives you details about how your loved one is doing. That way, you won’t have to feel worried about their health. Thank you for commenting, Scott. Our secure, web-based tool allow you to monitor the schedule and in-home care of your loved one while also keeping you in touch with our FirstLight caregivers. It provides the opportunity to submit feedback and it gives you peace of mind. That is so important when you cannot be there. That is why we take care of your loved one just as you would. An in-home care service that offers ongoing training really would be helpful. After all, it never hurts to learn more about how to properly take care of people. It would be both a huge benefit to you and to your elderly loved one who the caregiver will be working with. Good idea to find someone who participates in ongoing caregiver training, it shows dedication on their part. We’ve been looking for a caregiver for my dad recently and we’ll check for that now. We don’t want someone who’s content to sit around all day. Thanks for the tips on finding the right in-home caregiver for your loved ones. You definitely want to find a company that is willing to send out multiple people so they find the right fit for your loved one. My mom is looking for a caregiver for my grandpa and she is having a hard time; I will be sure to share this with her. Thanks for sharing your feedback, Hector. And thanks for reading! Thanks for this advice for getting a caregiver. It’s good to know that you should try to find a good caregiver that can talk with the rest of the family about the ongoing care plan they will be doing. This seems extremely important especially if the rest of the family knows exactly what they can expect from a caregiver.